Overview - Gerhard Richter Painting is a thrilling document of legendary German artist Richter's creative process, juxtaposed with intimate conversations (with his critics, his collaborators, and his American gallerist Marian Goodman) and rare archive material. From our fly-on-the-wall perspective, we watch the 79-year-old create a series of large-scale abstract canvases, using fat brushes and a massive squeegee to apply (and then scrape off) layer after layer of brightly colored paint. This mesmerizing footage, of a highly charged process of creation and destruction, turns Belz's portrait of an artist into a work of art itself. Comes in collectible Blu-ray book with 16 page photo gallery of Richter's work. DVD only available together in in the Blu-ray book. "I don't know what to do next," laments the soft spoken artist who rests at the center of 'Gerhard Richter Painting.' With no plan, and no clear direction, he methodically attacks his canvas, smearing it with abstract textures and colors over and over again until it's finished. And when is it finished? Well, as the staunch perfectionist claims, when it's "good." A fascinating, candid look into the heart of the creative process, the documentary examines the mysterious relationship between art and artist. Intimate, stripped-down, and honest, the film offers a rare peek into the mind of a true master. 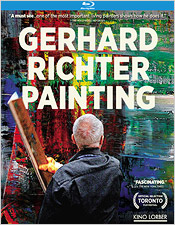 Filmed in the spring and summer of 2009, the documentary follows world renowned German artist, Gerhard Richter, as he paints and prepares for gallery exhibitions. Known for a variety of different styles, the movie primarily focuses on the creation of his abstract work, granting the filmmakers full access to his studio. Fly-on-the-wall footage of Richter painting is interspersed with on location interviews and brief archive footage, all adding up to form an insightful, multifaceted portrait of the artist and his creations. While the film does briefly touch upon Richter's personal life and history (including a rather poignant sequence where he looks over family photographs), this really isn't a conventional overview of the man. Instead, the filmmakers present a more concentrated portrayal, and spend most of the runtime focused on candid footage of the artist in his studio. The shooting style is straightforward but rhythmic, and the filmmakers even employ a faintly experimental tone through simple montages of Richter's paintings set to subtle avant-garde sounds. While the artist does attempt to go about his business naturally and unaffected, he actually expresses concerns about the camera's presence, worrying about the effects of painting under observation. This gentle "intruder" aspect to the production adds another layer to the experience, and increases the undercurrent of tension that runs throughout Richter's process. There is an almost hypnotic quality to watching Richter paint, and several extended sequences simply show the man in action as he carefully manipulates his canvases into something extraordinary. In addition to his brush, the artist's primary tool is a specially designed squeegee that he uses to make slow horizontal and vertical movements across his paintings. These dramatic gestures simultaneously wipe away and build upon the artist's original compositions, forming something new in their place with sometimes radically transformed colors and textures. Richter openly admits that there is no real conscious method to his madness. To him, a painting simply presents a dilemma, and he continues to work until "nothing is wrong anymore." While watching a man methodically smear colors might not sound like a particularly compelling experience, the process is oddly enthralling, and the filmmakers capture his movements beautifully. Through his paradoxically deliberate and seemingly arbitrary strokes, Richter's style is somehow random and meticulous at the same time. What starts out as colorful nonsense splattered across a canvas, slowly evolves into something truly captivating, and just as it looks like Richter might finally put down his tools, he returns once again to completely reshape his work. Rarely satisfied, the painter is highly critical of his own art, and even as he prepares to hang his paintings up at an exhibition, he comes back to totally rework them. With that said, Richter never comes across as egotistical or overbearing. Instead, throughout the film's numerous insightful interviews, he always seems quite friendly and affable. His obsessive neurosis isn't domineering, it's quiet and subdued, gently but incessantly pushing him to perfect his art. What was once a maze of color becomes a nearly white-washed portrait of abstraction, and Richter's compulsive need to keep going by destroying and recreating his art (even after his assistants and colleagues insist that the work is good) is mesmerizing and frustrating to watch. He's searching for something, and even he doesn't know what it is until he finally sees it. Throughout it all, even when he's clearly tense, distraught, or disillusioned, he always seems to enjoy his work. Sure, much of the runtime shows the man in a constant state of retrained doubt, but certain instances -- like a moment where he discovers a hidden stroke of color beneath an otherwise gray canvas -- are filled with tiny hints of childlike glee. As the filmmakers so astutely reveal, the creation of art isn't just a neurotic, habitual necessity for Richter -- it's a joy. 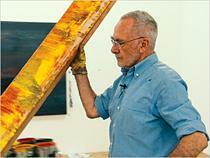 At times, watching 'Gerhard Richter Painting' is like watching paint dry. Literally. And yet, somehow it's oddly compelling. While I can understand why this candid, low-key approach might not appeal to many viewers, I was fully enthralled by Richter's process and philosophy. The filmmakers engender a rhythmic, hypnotic tone that slowly reveals the passion, obsession, doubt, and joy that rests beneath the artist's soft spoken demeanor. On the surface, the material might not seem particularly stimulating, but somewhere between the extended footage of Richter endlessly smearing paint and meticulously deciding where to hang his art, the documentary cuts to the heart of the artistic process and offers a gripping portrait of a fascinating man. Much like Richter's art, the film itself has hidden layers of depth and texture. By the time the credits role, the mysteries of creative inspiration and compulsion might still remain elusive, but the filmmakers manage to catch genuine glimpses of their awe-inspiring spark and unknowable grasp. The reasons behind an artist's desire to create are seemingly complex and inexplicable -- but perhaps at its core it really is as simple as the film's final lines imply. It's just damn fun. Kino Lorber brings 'Gerhard Richter Painting' to Blu-ray on a BD-50 disc packaged in a keepcase with a cardboard slipcover. After some logos and warnings the disc transitions to a standard menu. The packaging indicates that the release is region A coded. The movie is provided with a 1080i/AVC MPEG-4 transfer in the 1.85:1 aspect ratio. Though decent, the film appears to have been shot with relatively low-grade equipment, and as such the transfer is home to some periodic artifacts and anomalies. The digital source is often fairly clean, but aliasing, shimmering, ringing, and noise are apparent to varying degrees throughout. There is also a faint blurring quality in motion and there are times when the image appears slightly jittery (almost as if certain shots were filmed at a different frame rate). The image is never exactly sharp, but clarity is solid, and one can make out all of the brushstrokes and textures in Richter's impressive work. While the artist's studio is quite bland in appearance, the paintings themselves feature rich saturation, lending Richter's art a pleasing level of pop. Contrast and black levels are both steady, but the picture does have a predominantly flat quality. The digital artifacts are not ideal, but they're most likely inherent to the source. The video is far from impressive, but the artistry of Richter's work shines through beautifully. The audio is presented in a German DTS-HD MA 5.1 track with hardcoded English subtitles. Surprisingly immersive and nuanced, this is actually a very strong mix that enhances the film's hypnotic and introspective mood perfectly. Speech is clear and easily heard throughout. The soundstage is delicate but spacious, creating a great sense of reverberating atmosphere in Richter's wide open studio. Tiny, ambient effects make their way around the room, spreading the gentle clatter of the artist's workspace naturally between the front and rear speakers. The film's moody score also bolsters the content well, with strong fidelity and separation. Likewise, the filmmakers utilize some slightly avant-garde design choices, sneaking in subtle effects like birds chirping and blowing wind into various montages of Richter's art. Subtle sounds, like the splatter of paint on canvas, are given ample weight, immersing the audience in the artist's world. Dynamic range is solid but the content doesn't really call for much low frequency activity. Despite the film's extremely modest content and scope, this is an unexpectedly enveloping track. Though subtle, the filmmaker's employ some interesting sound design choices, and the mix carries an exceptional sense of rhythmic atmosphere. Kino has included a decent assortment of bonus interviews, and in a fairly odd decision, some BD-Rom exclusive text based extras (haven't seen that in a while). All of the special features are presented in 1080i with hardcoded English subtitles and German LPCM 2.0 audio. Buchloh Conversation (HD, 24 min) - This is a conversation between Richter and art historian Benjamin Buchloh. The pair offers a heady discussion on the philosophy of interpreting art and its comparison to music. 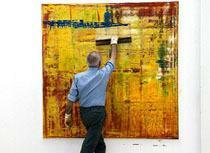 They also touch upon some of the photo inspirations for Richter's paintings and elaborate on his abstract style. The conversation can get a bit oblique at times, but art fans will likely want to take a look. Obrist meets Richter (HD, 10 min) - In this interview, Curator Hans-Ulrich Obrist asks Richter about several projects his worked on over the years. There's also an amusing bit where they reveal how they come up with the titles for their exhibitions. Richter Prepares (HD, 9 min) - Lots of raw footage of Richter preparing for his "Abstract Painting" exhibition in Munich is presented. Mostly just clips of the artist deciding where to hang up certain pictures, this isn't exactly riveting stuff. Photographs of the finished exhibit are also shown. BD-Rom Content - Accessible only by exploring the disc on a computer with a BD-Rom drive, this is a PDF document that contains eight pages of some additional text based material: "Director's Notes," "Interview with Corinna Belz," and "About Gerhard Richter." Some photos of the artist are also mixed in. While there are some decent insights here, I'm not sure why they couldn't have just been accessible from the main menu. Trailers (HD) - Several trailers for other Kino Lorber releases are included. 'Gerhard Richter Painting' offers a hypnotic and insightful peek into the creative process. At times, the documentary is literally like watching paint dry, but somehow it remains utterly captivating. The video transfer is decent but does suffer from some artifacts, and the audio mix is surprisingly immersive and nuanced. A small but welcome collection of additional interviews rounds out the package. While the film's methodical, stripped-down style might not appeal to many viewers, those interested in the intricacies of the artistic process should definitely give this a shot. Recommended.